Thanksgiving came and went, but I wanted to document and share with you some of the recipes I tried out this year that were a hit. We tried a gardein veggie roast this year, had mashed potatoes, green beans, stuffing, cranberries, sweet potatoes and brussel sprouts. And finished with pecan pie! The recipes for the sweet potatoes and brussel sprouts follow; the pecan pie recipe will be up soon! Peel and roughly chop sweet potatoes into large chunks. Place into a large pot and cover with water. Bring water to a boil, reduce heat to med-high, and gently boil for 10-20 minutes, until the potatoes are fork tender. Drain. Preheat oven to 375F. Lightly grease a 2.5 quart (10 cup) casserole dish and set aside. Bake, uncovered, at 375F for 16 to 23 minutes, until the dish is hot throughout. Plate and serve immediately with a pat of vegan butter or coconut oil. Line a baking sheet with aluminum foil. In a large bowl, toss brussels sprouts with 2 tablespoons olive oil, kosher salt and pepper, basamic and agave. Transfer the brussels sprouts to baking sheet and roast, stirring occasionally to ensure even browning, until tender and caramelized, about 20-30 minutes. Milo had to decorate a turkey for school this year. We had fun raiding the craft supplies and going to town with this. Yah, they are the universal sign of thanksgiving around here, but doesn’t mean you have to eat them! Instead of eating a turkey this year, consider adopting one! We adopted Robin this year! It’s definitely starting to get cold here, so a new snood was in order for miss stella-bean. Her one from last year started to unravel, so I knit her this one up, making it a bit taller than last year’s as well. You can find the pattern for sale, here. These are pretty easy to make too, if you are a beginner. You just need to know how to knit in the round. I dont decrease the stitches like the pattern says to, and I had to you tube how to bind off a different way so that my stitches werent so tight. This year’s version turned out much better! I found this recipe on pinterest forever ago, and i knew one of these days I was going to get around to making it. I made it this year for halloween, and Im happy to report, these were a hit! Not only do they look great – they taste really great too! They taste like cake batter, they were very soft and kind of cakelike and super fun to make and to eat. The kids loved to eat the candy eyeball in the center! I had to do some searching to find a vegan yellow or white cake mix, but I was able to find one. Just check the ingredeints – its out there! Beat earth balance vanilla, egg replacer and vegan cream cheese until fluffy. Mix in cake mix. Add green food coloring until it’s the color you want. I used neon green. Chill for 30 minutes. Bake at 350 for 10-12 minutes. 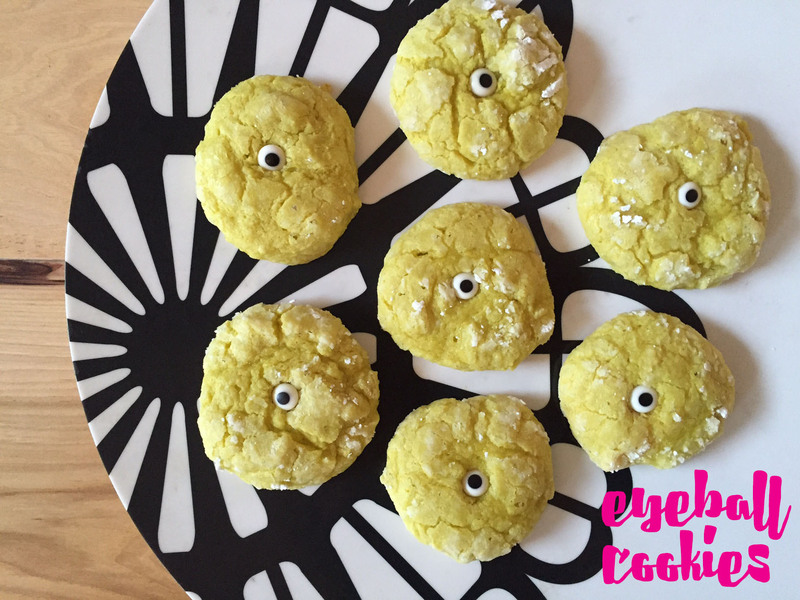 While warm push eye balls into the center or all over the cookie. ENJOY! The last of the halloween posts! Just wanted to share these fun cupcakes I made. Since you need the filling on the both sides for the owl eyes, thats where the dirt cupcakes came in. On the left over side that didnt have the filling, i put these in a blender and made “dirt” then dipped the tops of the frosted cupcakes into the oreos – then crammed some gummy worms in there. These were of course, the first cupcakes the kids went to! They love their gummies. 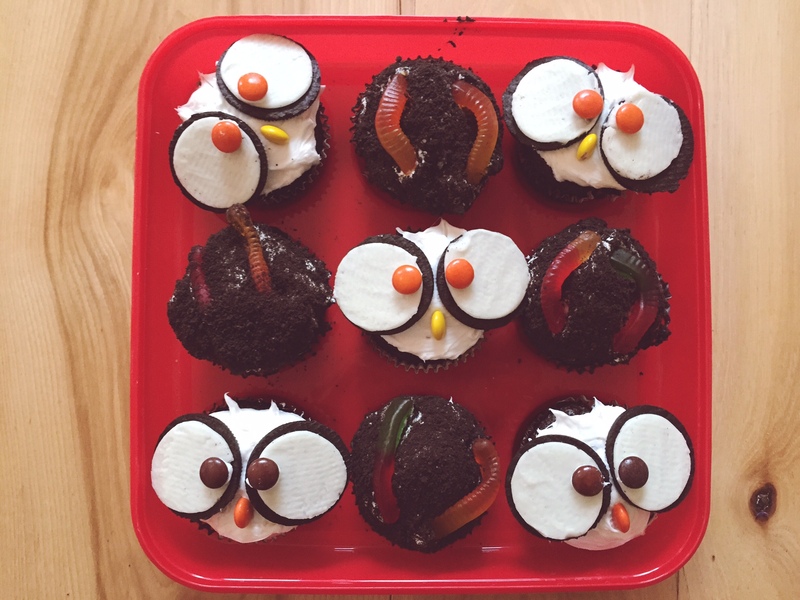 The owl cupcakes, i just split the oreos, placed some skittles for the beak and eyes, (I used frosting to “glue” the eyes down) and spiked up the frosting at the top for ears. han and leia halloween costumes. Halloween has come and gone, but i have a few posts to share about our costumes and some of the treats we made! My son was going to be a character from star wars rebels this year – sadly we purchased his costume, but his mom and dad were able to throw together a han and leia costume thanks to the thrift store and amazon.com! 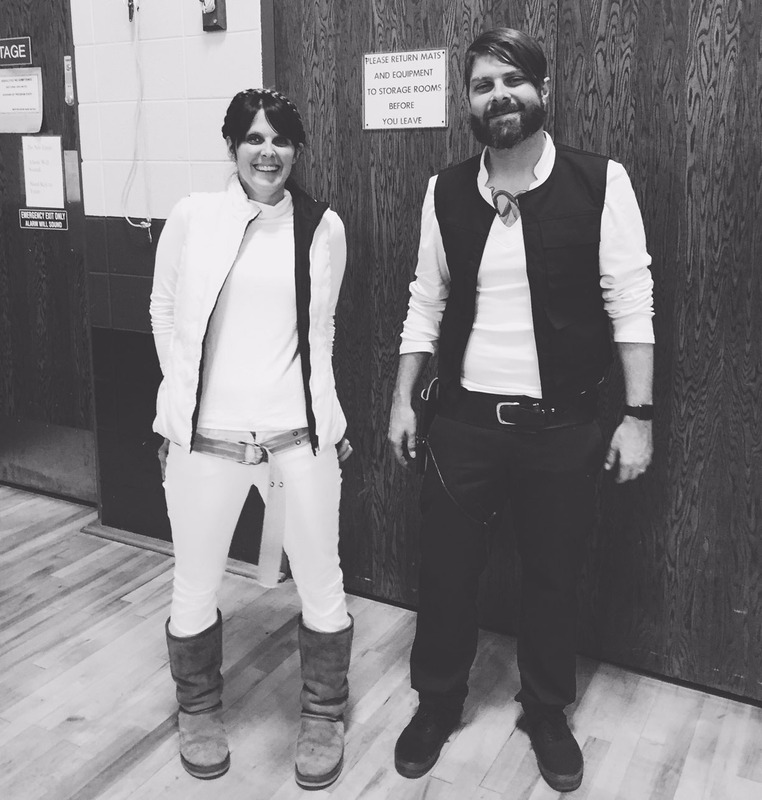 For leia – i found a white turtleneck, white pants, brown boots, and a brown belt at the thrift store! These were all suprisingly not very hard to come by. Within two trips I had everything I needed. I had a harder time finding a white puffy vest, but my friend came to the rescue with that one! I put my hair in crown braids, and VOILA! instant Hoth Princess leia. For Han Solo- my husband wore some navy blue dickies that he already had. We had plans to sew some ribbon along the side, but never got around to it. Would add some more authenticity if you had the time…He found this shirt on amazon, and got a vest similar to this, also on amazon. He went all out and got a holster as well. 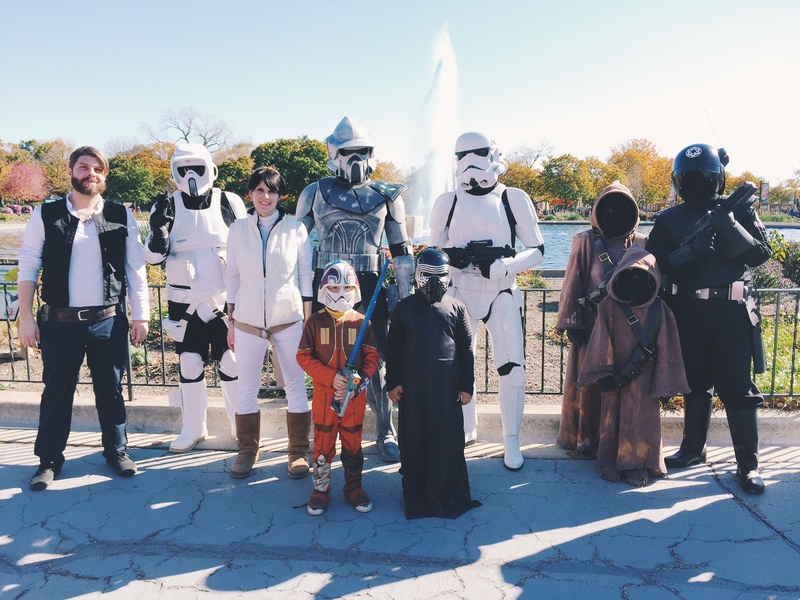 bonus shot: while at the zoo, earlier in october, we found some of our people!